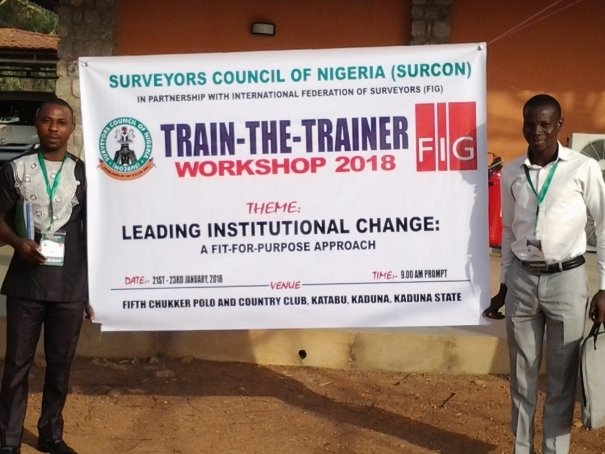 The Surveyors Council of Nigeria, invited FIG Vice President Diane Dumashie to actively anchor the 2 day SURCON train-the-trainer workshop, held at the Fifth Chukker Polo Club in Katabu, Kaduna, Kaduna State Nigeria, attended by 100 leading academics from across the Federal Republic of Nigeria. Surv. 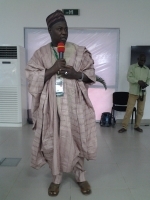 Kabir M. M. (Registrar SURCON) and his team organised and chaired the workshop to ensure the success of the 2 day meeting, particular thanks also goes to Pamela Abonika (SURCON), a member of Women-in Surveying, and who was indispensably on logistics. 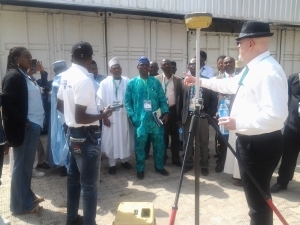 The annual workshop is designed for the participation of lecturers and instructors in accredited Institutions offering Surveying and Geoinformatics in Nigeria. Importantly members of the young Surveyors network are appreciated in their assistance and the incredible show of enthusiasm for the workshop. The 2018 training event consisted of 14 sessions. Over a day and one half, a masterclass designed and delivered by Vice President Diane Dumashie and assisted by Winston Ayeni to ensure the final masterclass session was able to link to the country context. The Masterclass is a twofold approach: the participants explored the basis of leadership in the context of relevant global trends, underscoring the importance of leadership that engages and influences innovative change, and second building an awareness of the emerging concept of Fit for Purpose approach’ in land administration systems. 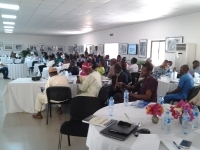 With over 100 participants attending from across Nigeria, they together comprised a diverse and generational mix. Honoured by the inclusion of a traditional title holder who is also a qualified land professional, members of the Education Committee of the Council and several Surveyors Generals joining the academics, this proved to be an audience that delivered articulate insights, probing analytical questions consequently providing informative deliberations. Recognising the significant global trends in governance, the 2018 workshop was designed as a peer learning event and to enable participants to consider new trends within the profession that will have direct impact on how our profession operates. 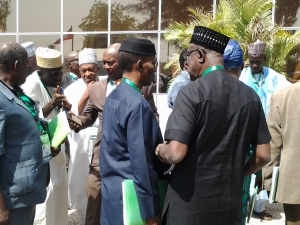 Importantly, by rigorously working through the FFP approach the delegates clearly articulated the relationship between ‘international and ‘national’ land governance priorities and ensuring it remained in the country context, they were able to gain a clear appreciation of the dimensions and dynamics between the governance levels of professional leadership; applying this to the Nigerian context of federal and state jurisdictions. Underscoring the importance of this topic in Nigeria, Kabir M. M, Diane Dumashie and Winston Ayeni, were honoured to hold a side meeting with the Governor of Kaduna State Mal. 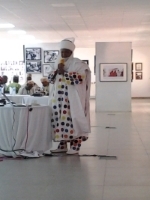 Nasir El -Rufa'i where his show of commitment to support the workshop aims and objectives was appreciated. 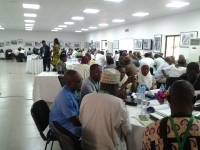 The delegates concluded that the masterclass created a strong and lasting understanding of the FFP framework; having overviewed the three mutually reinforcing core frameworks (spatial, legal and institutional). 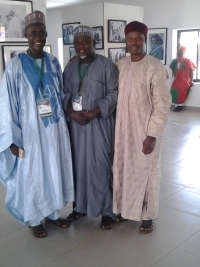 Such understanding and discussion will enable them to enhance their own students learning. Importantly the topics discussed has built the confidence to lead strategic change in the land sector, and make a positive impact on the student cohort, of which many attendees have responsibilities to deliver rich and contextual learning. 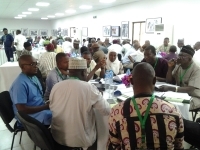 The final session sought to concentrate upon the administrative and educational needs of the profession as this relates to SURCON and maintaining standards in training institutions, accordingly, a roundtable was Chaired by Dr. Chigbu Njike.